I cleaned the potatoes, peeled them, and cut them into 1/4” fries (well, Chad cut them for me), but he cut them perfectly! :) I then took the potatoes and tossed them in the oil and spices. How pretty do these look? 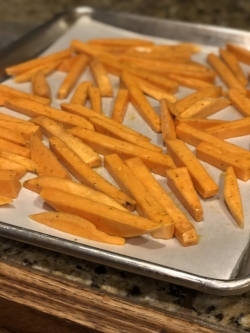 I then laid the fries out in a single layer on a parchment lined sheet pan and cooked them on 425 degrees F and turned them a couple of times over about 30 minutes time. And, Oh My Goodness…..they were so pretty when I pulled them out of the oven that I couldn’t wait to eat them! I sprinkled them with a little salt and fixed them up! Y’all these were awesome, and baked, and only took about 40 minutes total cooking time..well worth the little wait! In a shallow pan or tray, combine oil and spices. Scrub the potatoes well, and you can either peel the skin off, or leave the skin on. Cut potatoes into ¼” fries. Toss the fries in the olive oil and spices and coat well. Spread the fries out on the baking sheet in a single layer. Bake for 30 minutes, turning the fries 1 – 2 times until fries are browned and crispy. So, if you are looking for a quick, easy and healthy side dish, these sweet potato fries are awesome sauce!